A boat ride on the Chao Phraya River and Bangkok's many canals, khlong engines is one of the highlights of your trip to Bangkok. On such a trip, you can experience life in the khlong up close and see sampaner (The big riseboats) junks, Polehouses, and the beautiful temples, for example Wat Arun, Wat Po and the Grand Palace. The choices of guided tours on Khlong Bangkok is great. Trips depart from many of the moorings (bridges) along Chaophraya and may include content at one or more sites. Applications for such tours is available at moorings, at Oriental Hotel or Ta Chang. 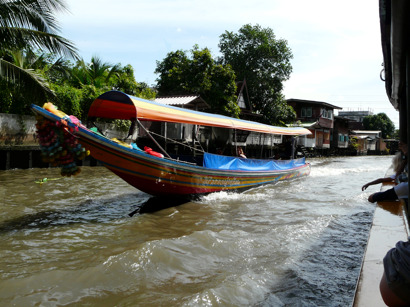 TAT (Tourism Authority of Thailand) have an overview of the different routes along the khlong in Bangkok. Bangkok's former nickname Venice of the East, is not entirely correct today when many Khlongs have been built over and become roads and buildings as the city grows. But in the remaining khlongs are Thonburi, you can still experience the way of life they had for centuries associated with the water. The removal of the khlongs have not been entirely trouble free. Since the city is built on wetland only 1 metre over the sea makes the streets of Bangkok is flooded every year during the rainy season when the streets the water does not have anywhere to go. Thereby decreases the city a few millimetres annually. Unless Bangkok to receive the East Atlantis in 2020, it is about time that those in power in Thailand should do something about the problem. One of the best ways to get from one place to another is by express boat between Thanon Tok south and Nonthaburi North .The boat stops at many places along the river. The stop at the bridge is very short, so make sure you are prepared for going on and off. The boat sails daily 06: 00-18: 00 and the tour cost a few baht. The whole trip takes about 1.5 hours to complete. The so-called Long Tail Boat function as water buses. A Longtail Boat is a long, flat-bottomed boat named after their long propeller shaft. The boat can go very fast and are very mobile. Longtail Boat sail out on the small khlong, to which Thonburi population lives. It will bring you close in to daily life with cooking, washing and bathing at the khlong. At the boarding spot at Chaophraya, you can rent a boat in the same way as with a taxi or take a local longtail boat that serves as a bus where people step on and step off. luxury liner Oriental Queen makes every day a trip to Ayutthaya. The boat departs from Oriental Hotel 08:00 and arrive in Bang Pa In approximately 12:30, lunch is included in the tour. Once you arrive a guide will show you around before you go back and you arrive back to the original location approximately 17:30. A nice excursion during your trip to Thailand .